I've been watching a lot of Sacramento Kings basketball games lately, and they always have a bunch of Carl's Jr. commercials. This one caught my eye. It features a Big Carl burger chatting with a sad Big Mac. It caught my eye because it was hard to tell if both burgers were equidistant from the camera. 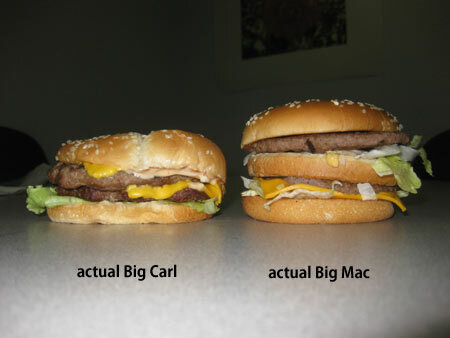 Was the Big Carl made to look larger by having it closer? 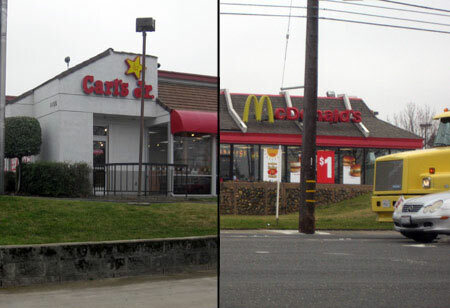 By chance, near where I work, an unsuspecting Carl's Jr. and McDonalds restaurant sit, right across the street from one another. It was time to double check that photography! 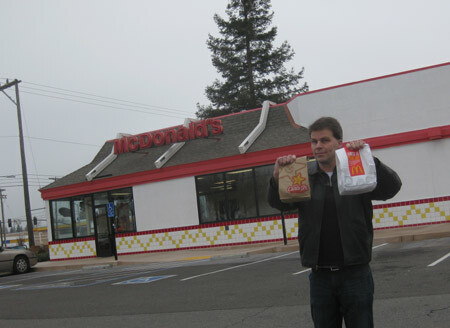 At lunch on Wednesday I picked up a Big Carl, then went directly across the street to get a Big Mac. The Big Carl was definitely less expensive. Picture 1: Side view of the packaging. 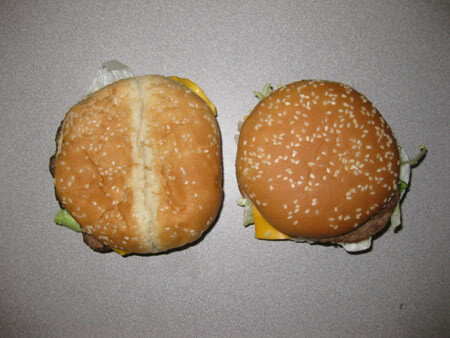 The Big Mac is on the right. The Big Carl came in a bag with napkins, as shown. The Big Mac did not, although napkins were available. From this angle, the Big Carl doesn't look like it would fit in that Big Mac box. Oh man. Someone let the air out of my Big Carl! What the heck? The Big Carl is definitely shorter, by an entire top bun! The Big Mac towers over it! Here are the two images again, side-by-side. I scaled the photos to match Big Mac heights. 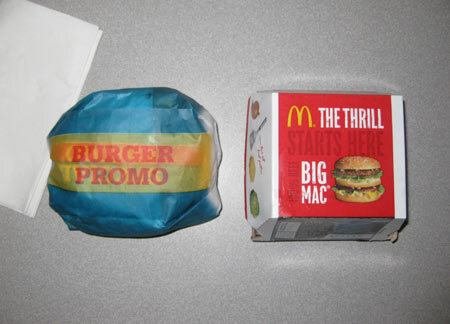 Neither burger looks as good as its television image. The horizontal black lines mark the top and bottom of the TV and real Big Macs, they are the same. 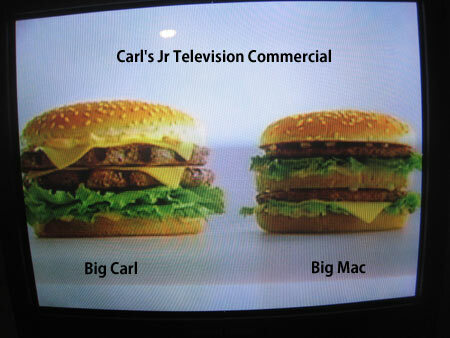 If the image from TV was true to life, the actual Big Carl should match its advertised height. 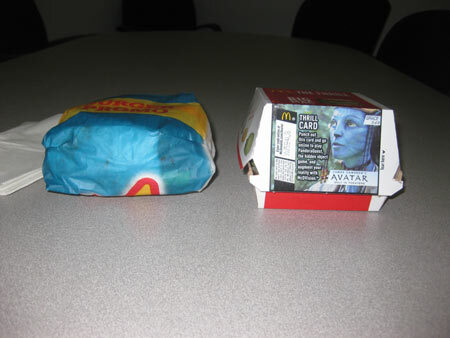 Usually fast food companies primp and position their food to look as good as possible on camera. There aren't usually any rulers or anything in the shot to actually gauge the size of the food depicted, so there are pretty loose reins on how close the images are to reality. 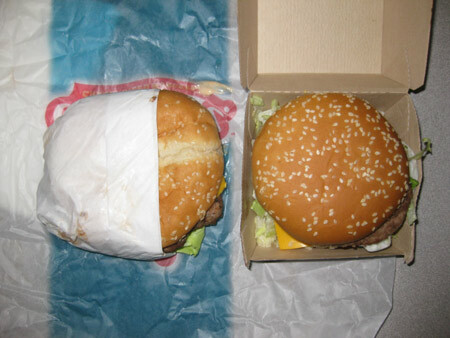 However, in this case, there is another burger, of known dimensions, for comparison. Thank you, Big Mac, for exposing this reckless distortion of the facts. I recommend to the court that we place Big Carl in prison for fraud.